This tutorial provides you with a foundation for working with Adobe InDesign panels. It is the first lesson in the Adobe InDesign CS6 Digital Classroom book. For more Adobe InDesign training options, visit AGI’s InDesign classes. 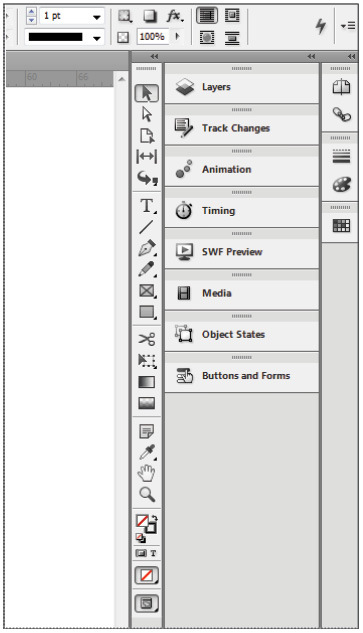 Another important part of the InDesign workspace are the panels used to modify and create objects. You can access panels by clicking on their name in the panel docking area, or choose the panel you want to access from the Window menu. The Tools panel is located on the left side of your screen and contains all the tools necessary to draw, add, or edit type, and edit items in your document. The Tools panel appears as a single column attached to the left side of your screen. You can modify the appearance and location of the Tools panel to accommodate your needs. 1 Click on the double-arrow icon ( ) at the top of the Tools panel. The Tools panel changes from a single column to a double column. If the Tools panel is not docked, you have a third option when you click the double-arrow; it changes to a horizontal layout, then to a single column, and then a double column each time you click. Go to step 2 to learn how to dock and undock panels in InDesign. Clicking on the Double-arrow icon at the top of the Tools panel changes its appearance between a one-column, two-column, or horizontal layout. 2 Click the gray bar at the top of the Tools panel, and while holding down the mouse button, drag the panel to the right, into the document area. Release the mouse button when over the document area. The Tools panel is repositioned as a free-floating panel at the location where you released the mouse button. You can position the panel anywhere on your display, or return it to the docking area on the side of the workspace. 3 Click the gray bar at the top of the Tools panel and drag the panel to the right so that it is positioned just to the left of the panels. A blue, vertical bar appears. Release the mouse button, and the Tools panel is docked to the right of your screen. If you have trouble moving the panel by clicking on the gray bar, click on the dotted area just below the gray bar at the top of the Tools panel to reposition and dock the panel. The tools panel can be docked along either the left or the right side of the InDesign workspace by dragging it into position using the gray dotted line near the top of the panel. Here the tools panel has been docked along the right side of the workspace. InDesign’s panels are essential for your design work. They help you create new objects, edit existing objects, and work more efficiently as you design your documents. 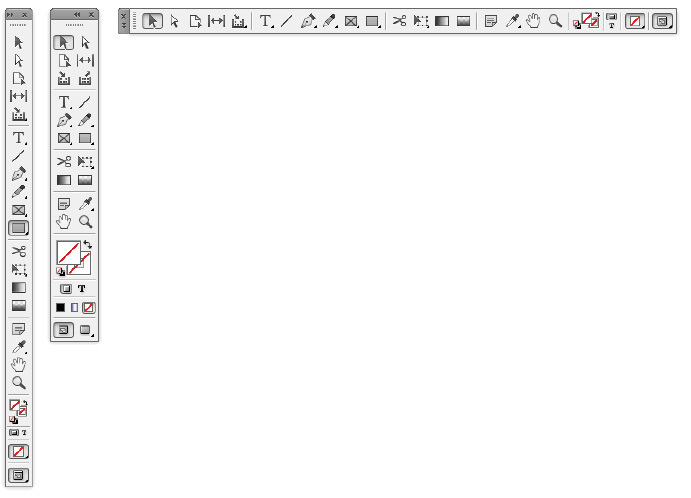 The various workspaces include different panels that are docked at the right side of the document window. The available panels change based upon the selected workspace. You can add panels to the workspace as you need them, or remove panels. When the panels display only their name or icon, they are in collapsed mode. Collapsed mode saves screen space by providing you with easy access to many panels, and only displaying the full panel when you need to access all the controls. Here you will work with the various display modes available for panels. 1 Click the double-arrow icon ( ) at the top-right corner of the docked panels that are in collapsed mode along the right side of the document window. Notice how all the docked panels expand to reveal their options. 2 Click the double-arrow icon again to collapse the dock and return the panels to their previous state. 3 Click the Pages button in the dock. This reveals the entire contents of the Pages panel. When you click a panel button, only the individual panel expands. 4 Click the Pages button again, and the panel closes and is displayed only as a button. 5 Place your cursor along the left edge of the panel docking area, where the panels meet the page area. When the cursor changes to a double-arrow ( ), drag the panels to the right until the panels display only as icons. Click and drag back to the left so the panels display as icons along with their name. Click and drag the panel docking area to the right so the panels take up less space and display only their icons. 6 Click and drag the Pages button, moving it to the far-left side of the document window. When a vertical bar appears, release the mouse button. The Pages panel is docked to the left side of the document window. You can place panels anywhere on your workspace, including over the document or on either side of the work area. You may customize panels in any way that makes it easier for you to work. Keep the panel in this location, as you will work with customizing workspaces in the next exercise. Once you have selected the panels that you need, and positioned them in the locations that let you work most efficiently, you can save the location of the panels being used as a workspace. Once you have saved a workspace, you can quickly access the exact panels displayed and their location by returning to the default setup of that workspace. 1 From the Workspace drop-down menu, located in the Application bar to the left of the Help search text field, choose New Workspace. Choose New Workspace to save the panels you are using and their location in the workspace. 2 In the New Workspace window, type My Workspace in the Name text field, and then click OK, leaving all the settings at their defaults. 3 From the Workspace switcher drop-down menu, choose Typography. 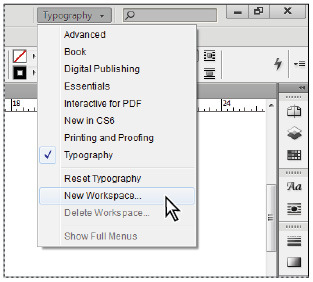 Then click on the Workspace switcher drop-down menu again and choose Reset Typography. Note how the panels revert to their default locations. 4 From the Workspace switcher drop-down menu, choose My Workspace. Alternatively, choose Window > Workspace > My Workspace. All the panels are restored to their location that was part of the workspace you saved earlier in this project. You can create and save multiple workspaces. Workspaces are not document-specific, and you can use them in any document. Before proceeding to the next section, reset your workspace to the default Typography workspace using the Workspace switcher drop-down menu. This allows the panels to match the descriptions used in the remainder of this lesson. If necessary, you can also choose Reset Typography from the Workspace switcher drop-down menu to reset the workspace to its default appearance. The Control panel appears across the top of the workspace. The panel is contextual, so the content of the panel changes depending on what tool you are using and what object you have selected. 3 Double-click the same headline. When you double-click the text frame, the Selection tool switches to the Text tool. The Control panel now displays information relating to the text.